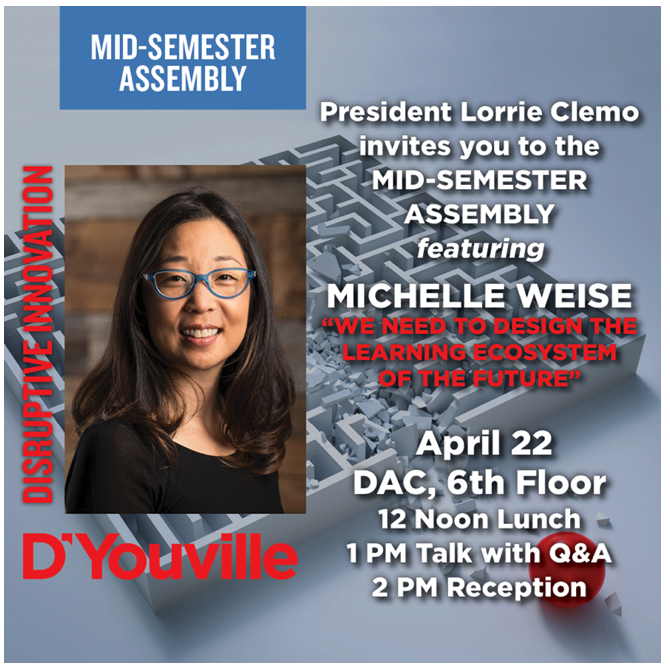 Faculty, Staff, Students and invited guests are all welcome and encouraged to attend our mid-semester assembly on April 22 featuring Michelle Weise. Weise is the Senior Vice President for Workforce Strategies and Chief Innovation Officer at Strada Education Network and will be on campus for a special luncheon on April 22. Her research focuses on student-learning outcomes, workforce solutions, and public-private partnerships. She helps to educate decision-makers on how the theories of disruptive innovation informs our understanding of the always-changing higher education setting and the future of learning.